As Dave said, I used to review comic books for another website. So, comics were actually my gateway in to Dice Masters. I just happened to see if my local comic shop was getting any starter sets in. He said he had one extra coming in that no one had reserved it. I had him hold it for me, and the rest was history. I had no idea at the time of the high demand for starter sets that would follow. I feel like I really just lucked in to getting a starter. As far as comics go, I’m a Marvel guy. I’ve dabbled in DC and other independent publishers from time to time, but the Marvel universe is where I’m most comfortable. My top 5 Marvel heroes, in no order, are Spider-Man, Nova, Daredevil, Cyclops, and Cable. My Favorite DC characters are Batman, Nightwing, Cyborg, Green Lantern, and Riddler. I’m very excited for the upcoming Uncanny X-Men set because we will finally get Cable as well as the modern version of Cyclops. Unfortunately, still no sign of Daredevil. As for the newly revealed DC Dice Masters set, I will probably buy the starter and a few singles here and there of significant characters, but I don’t see myself getting as in to DC as I have with Marvel. Well, that’s my introduction. I will close with this: my top 3 things I would love to see from Dice Masters in the future. #1. Figure out a multi-player rule set. A free-for-all style would be great, but a team battle setup would suffice. Ideally, I would opt for a multi-player campaign where players team up to battle Galactus. Galactus’ die (which would have to be 10 times bigger than any other die) could have Galactus attack, summon his herald, or count down the “timer” until he destroys Earth. Make it happen Wizkids, bring Galactus to Dice Masters! #2. Don’t stop with Marvel and DC. I want Image / Dark Horse / IDW Dice Masters. I want to be able to play with Spawn, Invincible, Hellboy, Ninja Turtles, etc. Wizkids is no stranger to incorporating outside licensed properties in to their games. They proved that with Heroclix, and I think this game could benefit from that type of expansion as well. #3. I would like to see small expansions, where nothing is randomized. You know exactly what characters you’re getting. Imagine a “Guardians of the Galaxy” pack. You would get Star Lord, Drax, Gamora, Rocket Racoon, and Groot. You get 2 versions of each character, with 2 or 3 corresponding dice. Then, incorporate its release in to the organized play events. Release it halfway through the O.P. events, and make them tournament legal starting with Month 4. That’s all for me this time. Where I’m coming from, what characters I like, and things I would like to see Dice Masters do in the future. Until next time, roll on. Welcome aboard again Randy! Glad to see there's a fresh new face, MDM fan, as well as Marvel comics fan in this site. Reserve Pool is my first go-to place for articles, reviews and everything MDM so glad to know it's growing. I feel you completely in that &quot;Obsessed&quot; department, I only felt this strong urge / obsession for Magic (been playing since '96ish till now). Probably because of the collectability, strategy involved, choice of playstyle, beginning moves options, probability that can be minimized / controlled, various deck building strategies, or it's probably just because a Marvel product..
Been reading Marvel comics and watching Marvel cartoons ever since I was a little kid too. I used to read DC extensively since Identity Crisis all the way to New 52, but dunno why I lost interest along the way, probably because of the dramatic changes some characters underwent (Supes-Diana, Earth 2 with very young JSA, etc). But villains month is the point where I stopped reading and focused on Marvel exclusively. I had this idea about recreating the battles in the comics, some sort of a &quot;campaign&quot; for MDM, but more like a What If... comic scenarios (because the winners aren't always like the one in the comic books). 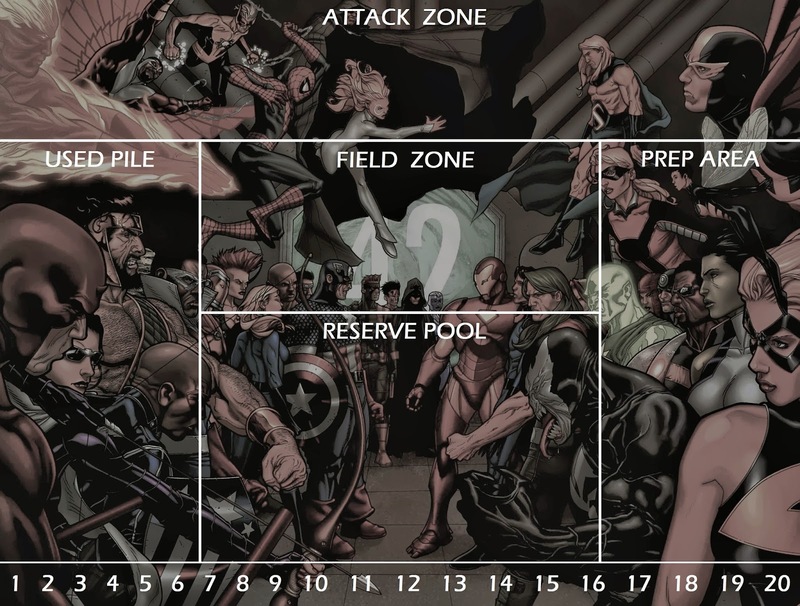 Example would be creating a 5 battle campaign between the X-men and the Avengers between 2 players. The battles and teams would be limited to a certain pool. Each player would pick either 4, 6 or 8 characters from said limited pool, recreating the battles in the comics. Interesting twist can be made to create major advantage to a certain player (due to the story in the comics). For example the Phoenix Force vs Nova battle, the Phoenix Force would already have 1-4 dice in its dice bag, while Nova would only have 1 or 2 tops. Same thing with the Phoenix Five battles vs Avengers, we can have each of the phoenix five have 1-2 dice in their dice bag for team battles or 3-4 for solo battles to represent their overwhelming power. Of course with the upcoming OP support for UXM taken from legendary comic arcs such as Days of Future Past or Phoenix Saga, we can recreate them too. Example would be Wolverine & Kitty Pryde vs an army of 6 sentinels or the sentinels would already have 2-4 dice in their bag. Stuff like that. What do you think? &quot;Hello I am Randy and these are my list of demands...&quot; lol jk! Welcome Randy!